Recently this article got into the tabloids. The comments were disabled very quickly. Strange. The authos says she has Aquagenic Urticaria but it is a skin condition not an allergy, and hence wouldn't cause an internal reaction like she says. She claims that drinking milk does not cause her mouth and throat to blister. If she is truly allergic to the water molecule as she claims, does it make sense that water with fats and sugars dissolved in it doesn't cause a reaction and she also doesn't have a constant reaction to her internal bodily water? I've come across at least a dozen cases of women claiming they are allergic to the water molecule and die if they drink water so they drink milk/tea/diet cola instead. So here we have yet another supposed case of someone having antibodies against the water molecule and being 100% healthy as long as they do not drink water. Does this match up to reality or medical science? Aquagenic urticaria is though to be caused by dissolved allergens in water and not by water per se. Aquagenic urticaria is a rare condition in which urticaria (hives) develop rapidly after the skin comes in contact with water, regardless of its temperature. Water allergy in itself is obviously a ridicule, as up to 60% of the human adult body is water. 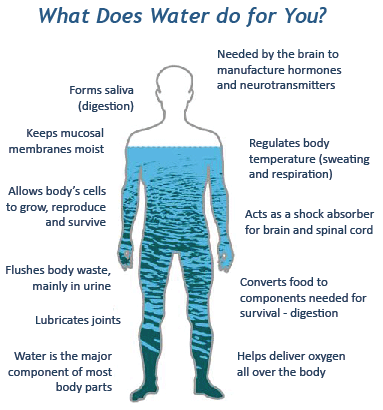 In fact, water is essential to our very existence (Fig. 1). Auto-immune responses to water would be disastrous, as pretty much all of our body would be attacked, likely resulting in anaphylaxis — a potentially life-threatening emergency. Further, small molecules typically are non-allergenic. Examples of allergens are, e.g.., chitine (a large polymer), drugs and even macrostructures such as pollen, all of them a lot bigger molecules than water. Instead, Aquagenic urticaria is thought to be caused by a substance dissolved in water that enters the skin and triggers an immune response. In this theory, the hives are not caused by water, specifically, but rather an allergen in the water. What also may be the cause is an interaction between water and a substance found in or on the skin generates a toxic material, which leads to the development of hives (Park et al., 2011). - Park et al., Ann Dermatol (2011); 23(3): S371–S4. Not the answer you're looking for? Browse other questions tagged human-biology immunology immune-system allergies or ask your own question.